Research at the University of Narmur (Belgium) led by doctoral student Annick Bay studied the optical properties of the Photuris firefly's abdomen. 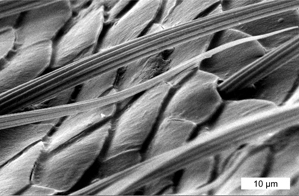 The scale structure (see microphotography at the right) was subsequently replicated on the surface of a standard LED, increasing the light emission by up to 55%. In an unmodified LED, The different refractive indices of the LED and air cause internal reflections. As in the firefly, the structured coating allowed more light to escape. It is not clear at this time whether this work is based on the 'biology to design' or 'challenge to biology' pathway. In either case, it is a particularly good example of analogical reasoning in terms of the range of steps involved. In addition, it is intriguing that the key researchers appear to be physicist with expertise in optics, neither biologists nor experts in LED fabrication. Additional discussion is posted at Knowledge Transfer Relating to 'Fireflies Inspire Brighter LEDs'.